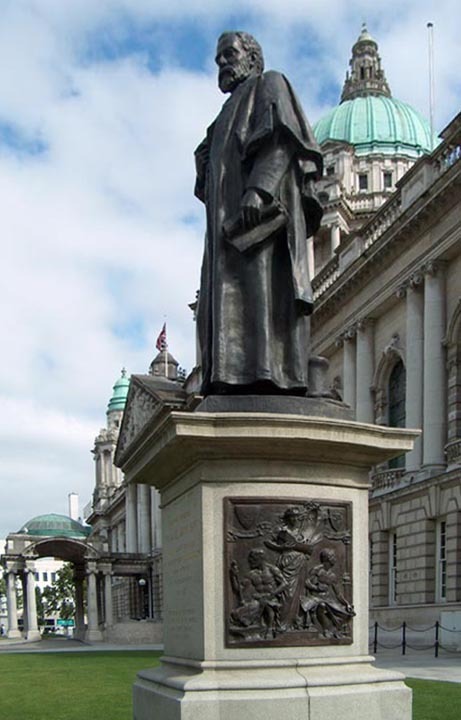 This statue depicts one of Belfast's "Four Worthies," the other three being Sir James Haslett, whose statue was executed by Pomeroy, the solicitor Sir Robert McMordie with a statue also by Pomeroy, and the great Sir Edward Harland with a memorial by Thomas Brock, whose firm built the Britannic, Olympic and Titanic). The various monuments around the grounds of City Hall include that to the victims of the Titanic disaster (by Brock), the soldiers of Belfast who lost their lives in the Boer War (by Sydney March), and the cenotaph and WWI Garden of Remembrance (by Brumwell Thomas). Photograph and text by Philip V. Allingham.